The Starbucks at 18th and Spruce streets. 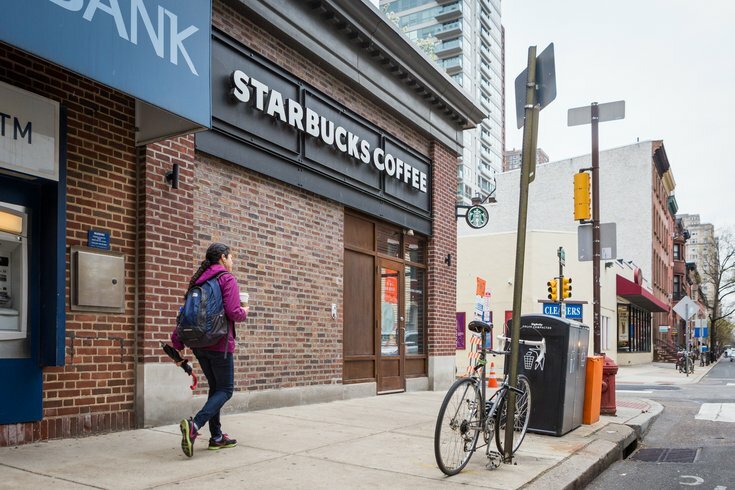 When the gates of outrage hell opened upon Starbucks locations near Rittenhouse Square and beyond last month, if you’d have asked me for the most token response imaginable, it’d have been a company opening its bathrooms for use by anyone at any time. Should Starbucks be lauded for reacting rather than brushing aside a lingering issue brought to the public conscience by the all-but-instant actions of a lone employee? Sure. Why not. Still, it’s a concession straight from the damage-control playbook, and one that – along with closing shops for a day of sensitivity training – leans more toward quelling criticisms rather solving the heart of the issue. This was about racial profiling by a private business where restrooms – in places like gas stations and restaurants – are typically reserved for paying customers. It was also emblematic of a horrendously offensive trend that sees police called on black people, by white people, for doing absolutely nothing wrong. Don’t believe me? Take a look at this selection of stories from America since the Starbucks incident in the City of Brotherly Love. Cops called on three black teens who, despite shopping for prom wear at a Nordstrom Rack in Missouri, were suspected of being shoplifters. Cops called to an LA Fitness in North Jersey after a worker maintained they hadn't paid, which they had. That’s what it looks like in 2018 America. And that’s why opening a Starbucks bathroom to the public comes nowhere close to addressing the inherent issue. With these unfortunate incidents in mind, I something saw over the weekend that actually could bring about change. At a minimum, it’d make people think twice about reflexively calling police on African-Americans despite the ever-present “see something, say something” mantra that’s damaged the way we see one another. Granted, my Irish skin is so fair that I get sunburn from writing the word sun. Still, the table-turning idea for black people to call police on white people they suspect of doing anything untoward in public is nothing short of brilliant (with a touch of petty). Set aside concerns about increased 911-call volume; those numbers are already higher because of the aforementioned, unnecessary calls. I think black people should be allowed to call the police on white people who look like they might call the police on black people. What one Chicago columnist dubbed a mission to “Call 1-800-TOO-WITE (to) report ‘suspicious white meddlers” would make a considerably greater difference in addressing the issue than would unlocking coffee-shop bathrooms. Sometimes, people need to be made uncomfortable before necessary changes come about. At a minimum, and in the name of fairness, it'll teach us to stop jaywalking and dishonoring the flag.